André Masson born [1896 – 1987] is a French painter, sculptor, illustrator, designer and writer, born at Balagny (Oise). Spent most of his youth in Brussels. He moved to Paris and studied at the Ecole des Beaux-Arts 1912-14. 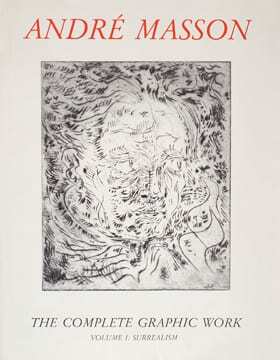 He experiments with automatic drawing, which lead him to participate in the Surrealist movement. During the early 1920s in Paris, Masson had a short Cubist-inspired phase before he became acquainted with the Surrealists, who introduced him to automatic writing. Made further works exploring chance effects, including sand paintings, as well as paintings of metamorphoses of animal and human forms, themes of germination, combats and massacres, with emphasis on violence and eroticism. He then returned to France in 1945 and settled in 1947 at Aix-en-Provence. Painted landscape themes such as mountains and waterfalls for several years, followed by some almost completely abstract pictures. His works also include sets and costumes for the theatre, book illustrations and a number of small sculptures; has written various books including Mythologie d’André Masson 1971. Surrealism is a 20th-century avant-garde movement in art and literature which sought to release the creative potential of the unconscious mind, for example by the irrational juxtaposition of images. I think that Chindogu’s are a type of surrealism as it started out from us combining images/things together that may not have a use.